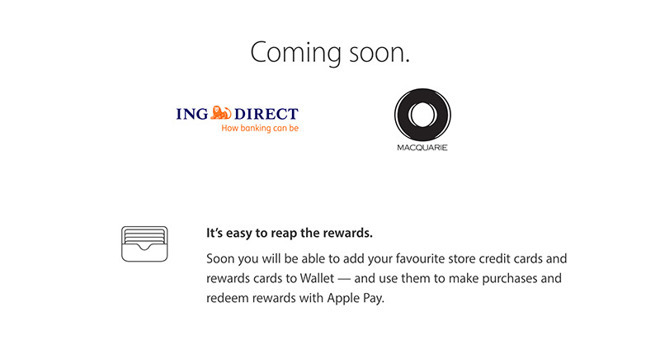 As Apple fights off regulatory attacks from Australia's "big three" banks in a bid to widen regional Apple Pay adoption, major international brands ING and Macquarie on Friday local time promised to support the digital payments system in the near future. The upcoming Apple Pay additions were announced in a statement to Reuters and subsequently added to Apple's regional Apple Pay website. Together, ING and Macquarie hold a relatively insignificant share of the Australian retail market, just 3 percent, but their international standing could put pressure on Apple Pay holdouts. Ben Perham, head of personal banking at Macquarie, said Apple Pay will add to the bank's digital offerings. "We've seen strong interest in Apple Pay from our customers and we're delighted to confirm it will be available later this month," Perham said. ING issued a similar statement, noting the bank's 500,000 Orange Everyday account holders prefer to manage their accounts on mobile devices. The comments are unsurprising considering neither Macquarie nor ING field a brick-and-mortar branch network in Australia. Since its Australian launch in late 2015, Apple Pay has garnered support from 11 financial institutions, most of which are considered smaller regional banks. Only one of Australia's "big four" banks, ANZ, has agreed to integrate the iPhone and Apple Watch payments service. The nation's largest lenders, National Australia Bank, Commonwealth Bank of Australia and Westpac Banking Corp, are putting up staunch resistance as they bargain for a larger slice of the digital wallet pie. To that end, the remaining "big three," along with Bendigo and Adelaide Bank, filed a complaint with the Australian Competition and Consumer Commission requesting authorization to collectively negotiate access to Apple Pay NFC technology. The application raises doubt over Apple Pay's rollout, claiming the Australian payments industry will be denied the opportunity to innovate and compete with Apple if the proposal to bargain is not accepted. A draft determination handed down in November sided with Apple, saying the benefits of the proposed Apple Pay boycott are "uncertain" and "limited."